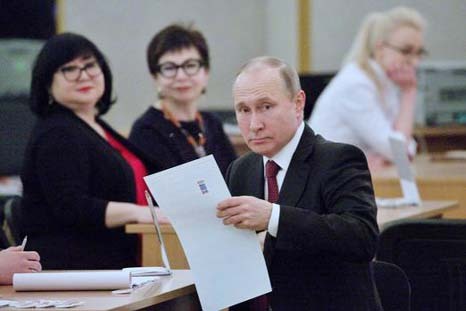 Russians voted Sunday in an election set to hand President Vladimir Putin a fourth Kremlin term, as the country is embroiled in a crisis with Britain and its allies over a spy poisoning. With the vast country stretching across 11 time zones, polls opened in the Russian far east at 2000 GMT on Saturday and will close in Kaliningrad, the country's exclave on the EU border, at 1800 GMT on Sunday. With Putin's main challenger Alexei Navalny barred from taking part in the poll for legal reasons, the result of the election is expected to be hugely predictable, with overall turnout remaining the only element of surprise. Some analysts say that after 18 years of leadership-both as president and prime minister-Putin fatigue may be spreading across the country, and many Russians are expected to skip the polls. The Kremlin needs a high turnout to add greater legitimacy to a new term for Putin, who is already Russia's longest serving leader since Joseph Stalin. In retaliation, Kiev said earlier this week Russians living in Ukraine would not be able to vote as access to Moscow's diplomatic missions would be blocked. Since first being elected as president in 2000, Putin has stamped his total authority on Russia muzzling opposition and reasserting Moscow's lost might abroad. Putin has sought to use the election run-up to emphasise Russia's role as a major world power, recently boasting of its "invincible" new weapons and continuing Moscow's support for the Syrian regime in a bloody civil war. Putin, who has run under the slogan "a strong president-a strong Russia", has declined to take part in televised debates and shot no new material for his own campaign advertisements. He is standing against a motley crew of seven challengers, including millionaire communist Pavel Grudinin and former reality TV host Ksenia Sobchak, but none are polling more than eight percent. Opposition leader Navalny has called on Russians to boycott the election he says is a sham. Many Russians say they would vote for Putin simply because they do not see an alternative, given his chokehold on domestic politics. Sergei Inshakov, a 37-year-old part-time taxi driver, said he would vote for Putin even though he was not getting enough state support for his two children. "I don't know where to turn to complain," he said, insisting Putin was still Russia's best hope. "We don't need changes now. Putin needs to finish what he started," he said. Levada's Stepan Goncharov said the independent pollster-which was barred by law to publish research related to the election during the campaign -- expected turnout to be between 57 and 68 percent. There has been a particular focus on the youth vote, with prizes offered for the best selfies taken at polling stations and a sexually charged online campaign that brands the election as "for adults only". Putin first became president after Boris Yeltsin sensationally resigned on New Year's Eve 1999. At the end of his second term in 2008 he handed power to his protege Dmitry Medvedev. Putin then served a term as prime minister - although few doubted who was really in charge - and returned as president in 2012. The run-up to Russia's last presidential election in 2012 was marked by protests across the country against Putin's return as head of state after four years as prime minister.